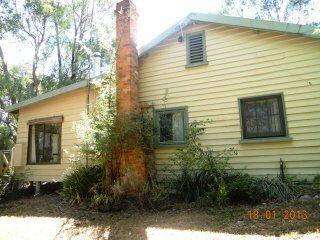 Holiday Cottage For Rent – ‘Wannawong’ 1062 Greendale to Trentham Road, Blackwood, (Martin Street corner of Warner Street). April 2015. For more information or enquiries for rental and cost contact – owner – Margot Hitchcock – margothitchcock@bigpond.com See page HOLIDAY HOUSE FOR RENT. Fully furnished, renting property. 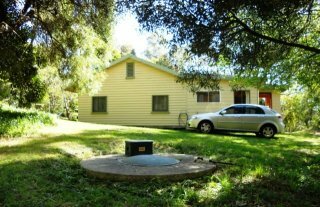 On 3/4 acre, well maintained property. 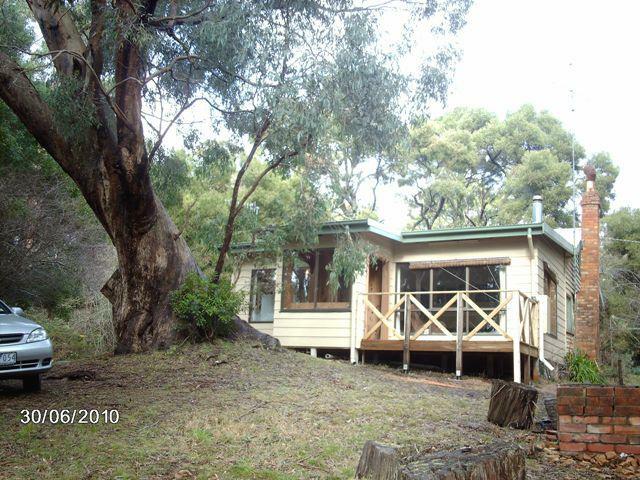 3 bedrooms, Lounge and kitchen facing north, Dining – living area, bathroom-laundry, shower and separate toilet. Slow combustion wood Heater. 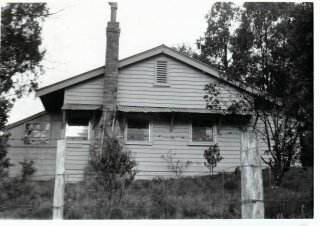 Built in 1930’s from timber from Barrys Reef School. Renovated 1980’s -1990’s. Biocycle Septic Treatment Plant. Excellent views from front verandah facing North to Blue Mount in elevated position. In main road, short walk to Hotel and Store. History of house – by Margot Hitchcock, Historian for the Blackwood & District Historical Society. My grandfather, Walter Warner acquired the 3/4 acre of land on a Miners right in about 1928 for which he paid 5 shillings (50 cents) a year. In 1928 Mr H.H. Cann (snr) purchased the remaining disused Barrys Reef school building (53′ x 20′) built December 1875 for the sum of 35 pound. He bought the school for my grandfather, Walter Warner and grandmother Mrs Dot (Frances) Warner (nee Conlon) and out of the timber our house was built by Magnus Williamson and Herb Cann Jnr. and completed by December 1929 and kept as a holiday house for the Warner family. My Uncle remembers the walls being brought to the block on a horse drawn wagon and being cut to size and erected where they still stand today. The front of the house has a new extension which was added in 1986, but the original section of the house still has all the old weather-boards, windows, doors and flooring off the old school. 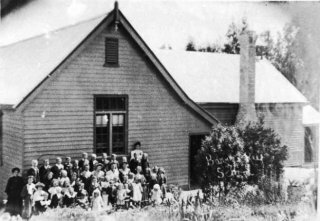 I researched the history of the school, part of which is in my book “Aspects of Early Blackwood” and found my house contains a lot of history of Blackwood. I have the board off the Barrys Reef school with State School No. 885 on it. 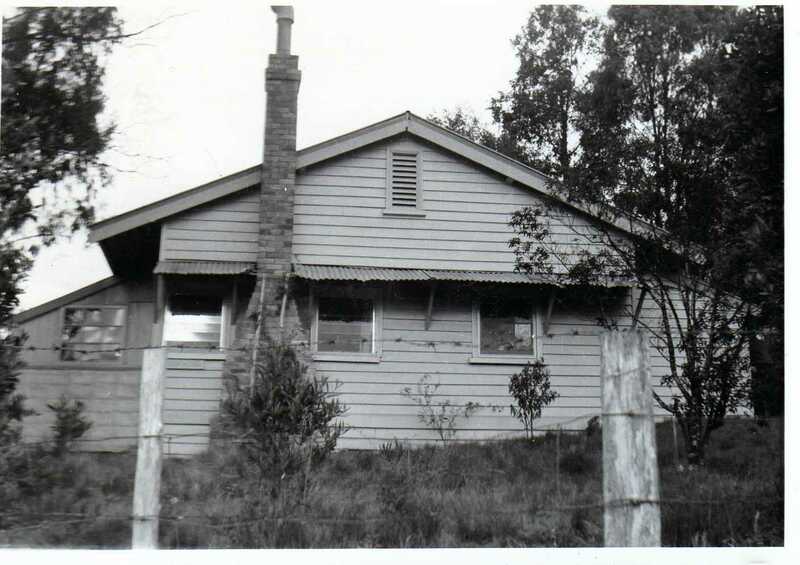 The house stands on a hill on the main road into Blackwood on the corner of Warner Street. 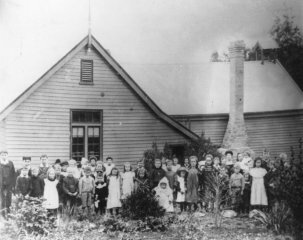 The original bricks were used to build the chimney and the iron was used on the roof. The inside walls and ceilings of the bedrooms were originally tongue and grooved pine boards (since being plastered over in the 1980’s, but original boards are still there underneath the plaster sheets.) The floor was rough knotted cedar pine boards as can be seen in the bunk bedroom). The original paint as can still be seen in the store room at the back of the house, was a dark shade of green and a pinkish brown. The school had 2 spires on the roof and one the owner has given to the Blackwood Historical Society’s Museum, (the other is in the store room). The upper outside vents from the school are now in the peak of the roof and can be seen on the front and side of the house. The owner also gave the Historical Society one of the school seats for display in their Museum, and the other seat is in the front porch). 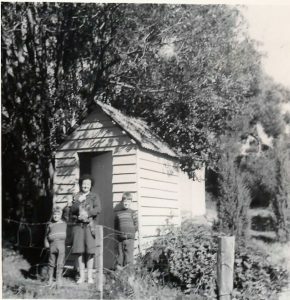 The 1940 The Lands Department, after consulting the Education Department, revoked the school site which was up on the hill on the left side of the Trentham Road in Barrys Reef. 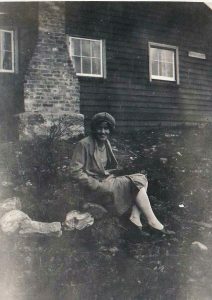 The ownership of the house and land was first put in my mother’s name, Dorothy Warner who when she married my father became Dorothy Roberts. 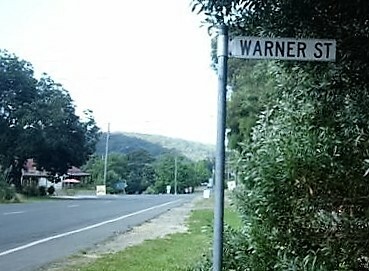 My mother who died age 98 years was very proud to have the street named Warner Street after her parents, which I had the local council organise. 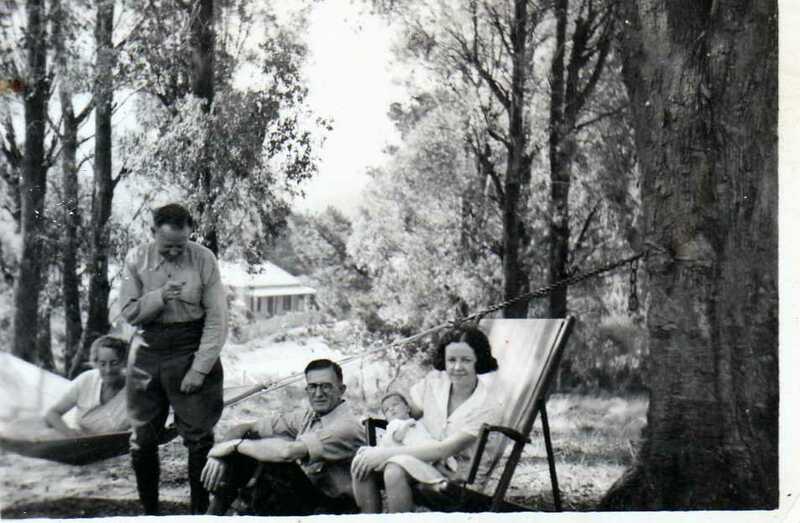 After my grandfather died in 1961 my mother bought the land off the Crown Lands Department and had the land surveyed and had the new fences erected where they should have been. The land originally extended out the front to where the road was cut back but Telecom had their wires on my fence so I had to sell this land to the Moorabool Shire, as this was used by a path by some people as well. In 1995 I first wrote to the Moorabool Shire Council asking that the road that runs around my property in Blackwood be named. My holiday house built by my grandfather WALTER WARNER in Martin Street allotment No. CA22b is named “Wannawong”. The telecom building is on one corner of the street that runs north and east around my 3/4 acre property. Being Historian for the Blackwood District Historical Society, I suggested some names of pioneer people who lived in houses in this street. 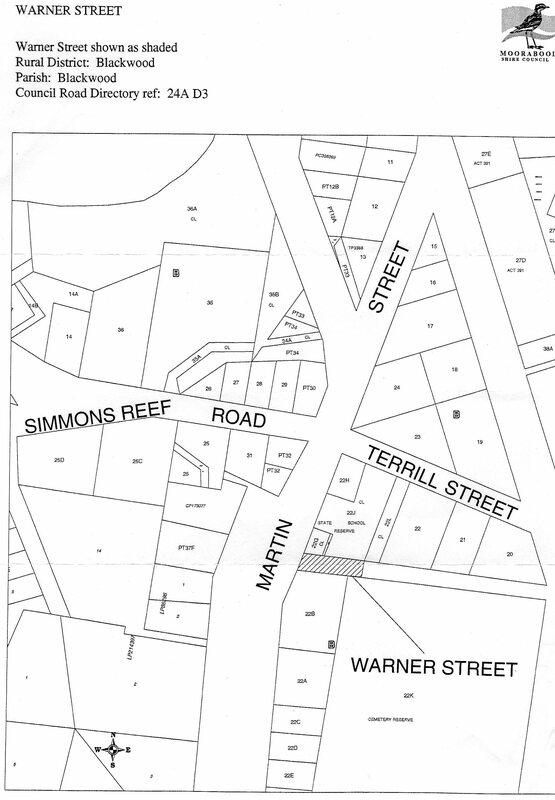 I received a letter in 1999 back from the Shire Council stating they would be placing a recommendation to the council to have the street named Warner Street after my grandparents. My great grandmother Fanny Eliza Conlon, went to live in Blackwood in the 1880’s after her husband James Thomas Conlon, an early Melbourne Architect died of Tuberculosis shortly before my grandmother Frances Kate Conlon was born on the 15th March 1877. As my grandmother was born premature my Great grandmother took her to Blackwood to live as a young child at about 6 years of age after she had contracted typhoid while visiting the Burrows relatives in Tasmania, as it was thought the Blackwood air would benefit her health. My great grandmother Fanny Conlon is listed in Wise’s Post Office Directory of 1890/91 as living in Blackwood as a dressmaker. 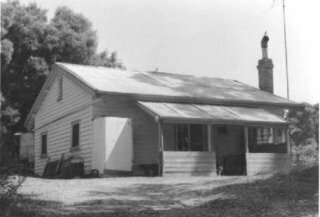 My great-grandmother then took my grandmother age 14 years, back to the family home in Richmond, Melbourne to live to further her education. My grandmother married my grandfather Walter Warner in 1899 in Melbourne in 1899 when she was 22 years old. My grandfather, Walter Warner was born in Melbourne in 1874 and his father Henry Warner was born in London in 1848. Henry Warner arrived in Australia with his parents in 1853. Walter Warner’s mother was Rebecca Mason, born in 1850 in Port Rush in Ireland, and she arrived in Australia with her family in 1852. My grandparents, Walter and Frances (Dot) Warner went back on many occasions to Blackwood after they were married and my grandfather used to say that he drove the first motor car into Blackwood in 1915, which was an early model Maxwell. In about 1928 my grandfather purchased our block of land in Blackwood on a Miners Right for 5 shillings a year. 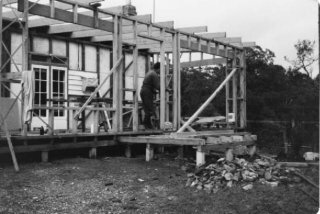 In those days you could own a block of land providing you built a house on the land and paid your 5 shillings a year to the Crown Lands Department. 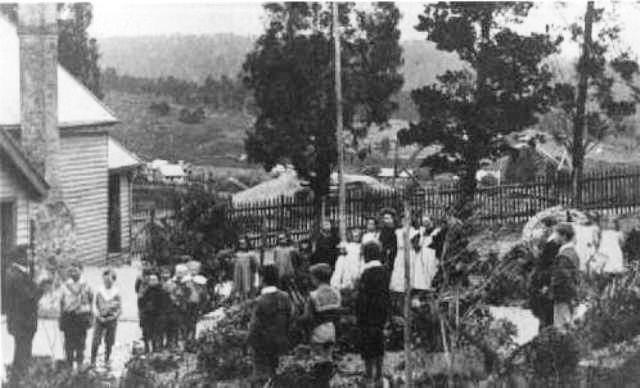 Photo of ‘Wannawong’ from main road taken by my grandfather on competition in 1929. 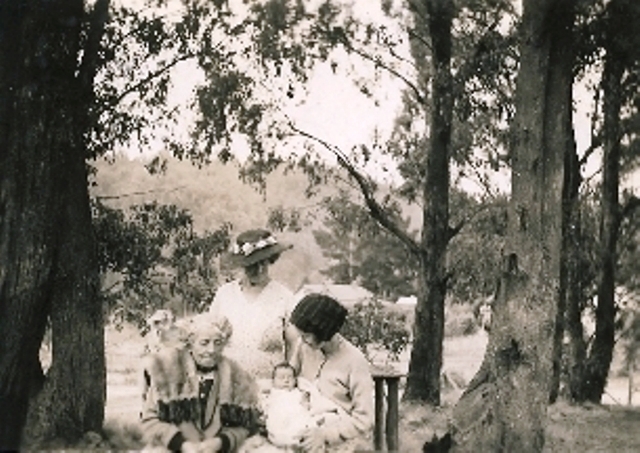 Photo of my mother, Dorothy Warner, taken on completion of ‘Wannawong’ dated 23 December 1929. 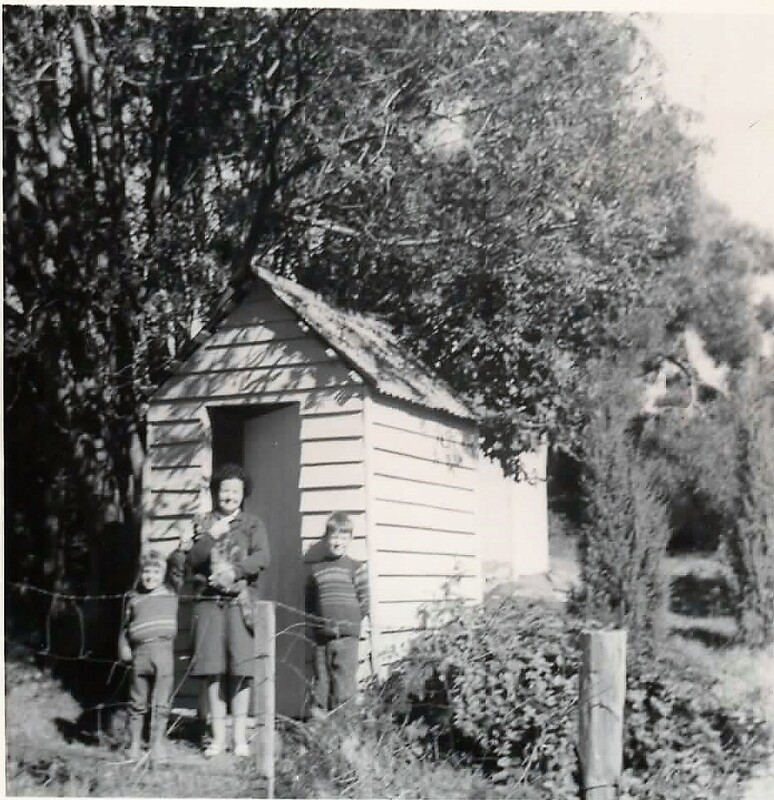 Outside Drop Two-Hole toilet originally from the Barrys reef School, with my mother, Dorothy Roberts, and my two children Philip & Sandra Hitchcock and our cat who came on holidays with us. 1969. Publicity photo with myself, Margot Hitchcock re. old letter with early stamps in the local ‘Leader’ newspaper with the Original State School sign – No 885 on the wall. 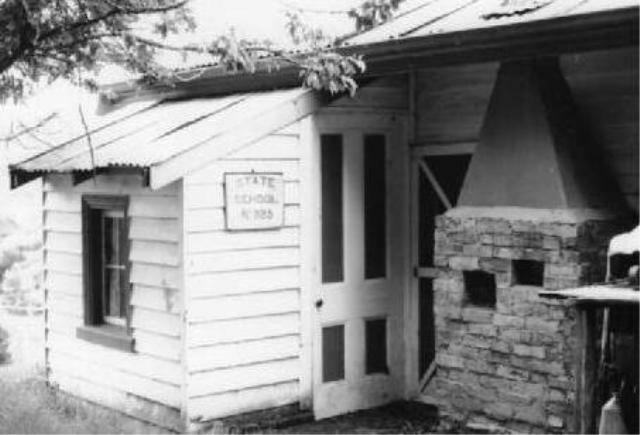 Back of the house showing store room and back door and original kitchen chimney and school sign. Now a modern toilet is in this space. Warner street sign on the corner of Martin street opposite our front driveway. Barrys Reef School and garden with school children after winning a prize for the best garden in the schools competition. Map showing property and ‘Wannawong’. on the corner of Warner street. History of Additions and improvements – The front part of the house was added as a lounge and kitchen and front porch with wood box in 1986 where the old verandah used to be. 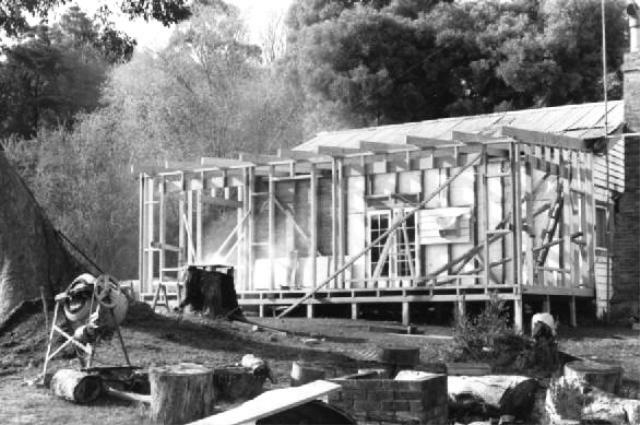 The original kitchen was converted to a bathroom-laundry with a separate toilet in 1995 and a Bio-Cycle Septic treatment plant installed by Kevin Nolan, Plumber of Ballan, who has regularly serviced it. The roofing iron, timber battens and guttering on the back of the house has been replaced in 2000 by Plumber Brian Moore. Outside of house was painted by Homestyle Painting, Greendale in 2001. Pink batts were installed in the ceiling in the original part of the house in 2005. Five new mattress’s and recliner chair were purchased in 2007. Antenna installed by Carl Schaefer Antennas and tuned in to local T.V. service. 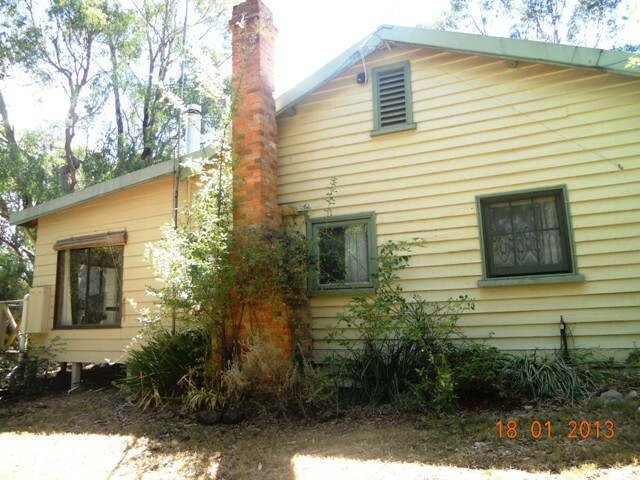 A new flue was added to the Norseman wood heater in 2010 by Kevin Nolan. The new front verandah was added in 2010. A new electric stove was installed by Bill Evans in 2011. Phone serviced by Telstra. The small shed out the back used to be the old toilet where garden tools and mower are kept. A store room is on the back of the house. The previous water tanks are now wood tanks. photos of house during renovatons in 1986 with new front kitchen and lounge room added where old verandah was. old verandah with shower on end in 1980 before renovations. Barrys Reef School c.1890, with front windows that was used as a front door at ‘Wannawong’ before renovations. Vents in upper outside walls can be seen in school, which are now in ‘Wannawong’ upper peaks in walls. 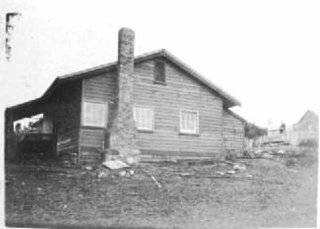 East side of house showing upper vent in wall and Bio-Cycle septic treatment tank.